Princeton’s rival Whig and Clio societies provided students with powerful platforms to discuss controversial issues of the day, frequently slavery and emancipation. From the late 18th century to the outbreak of the Civil War, members of both societies consistently opposed the emancipation of slaves, fostering a conservative, anti-abolition intellectual climate on campus. Princeton University’s American Whig-Cliosophic Society, today the country’s oldest collegiate literary and debate club, dates back to 1765. For much of its history the club comprised two societies—Whig and Clio—only uniting into one organization in 1928, when declining membership and the growing popularity of eating clubs forced the two rivals to join together. But for the first 150 years of their existence, Whig and Clio exerted an enormous influence on campus life and thought. More than just debate clubs, the American Whig and Cliosophic societies functioned in many ways as separate colleges within the College of New Jersey, offering their own classes, curriculum, and even diplomas—aptly described as “little Republics” unto themselves. 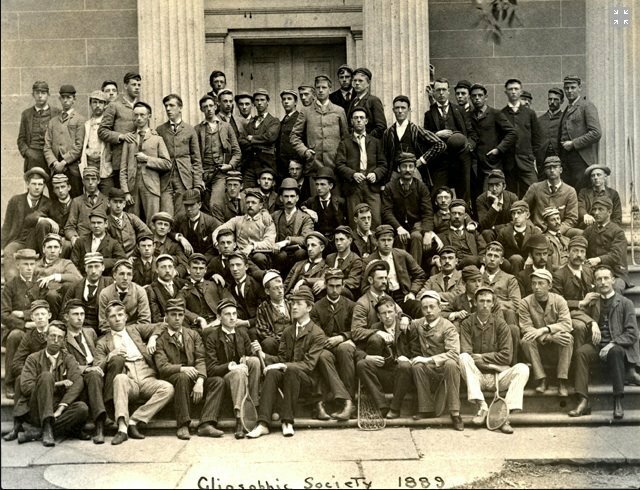 Members of Princeton's Cliosophic Society in 1889. Historically, Clio drew its membership from Princeton’s Northern-born students and Whig from the college’s Southerners (excepting Georgia natives, who traditionally joined Clio). From 1819 to 1860, Southerners comprised a larger proportion of Whig members than they did of Clio’s for all but six years; on average, 49% of Whig’s students came from the South, compared to only 30.1% in Clio. Between 1846 and 1850, Southern students made up the majority of Whig’s members, at one point reaching 73.9%. Clio’s Southern membership, on the other hand, rose above 50% only twice before 1860. Mounting sectional tensions throughout the country may have contributed to Whig’s sharp increase in Southern members, with Princeton’s Southern-born students joining Whig in greater numbers at times of particular crisis—after the Missouri Compromise in the 1820s and 30s, for example, and then in the 1850s, just preceding the Civil War. And yet, despite the fact that Whig was at times vastly more Southern than Clio, both societies typically reached the same conclusions when debating slavery. While the membership of these “little Republics” reflected the sectionalism of the 19th century, both groups presented a unified front against abolitionism. In the decades leading up to the Civil War, Whig and Clio reflected the conservatism of Princeton’s student body, favoring a unified nation with slaves to a fractured one without. The modern Whig-Clio Society looks very different from the “little Republics” of the 18th and 19th centuries. The importance of debate in these societies, however, has managed to endure. Just as Whig-Clio does today, the early American Whig and Cliosophic societies debated important questions of their time, discussing topics ranging from the longevity of the constitution, to foreign affairs, to domestic issues—and, quite frequently, slavery. For the American Whig Society, debates over slavery betrayed a clear and distinct propensity of its members to support Southern slaveholding interests. Considering questions such as “Can a state of equality exist in civil society,” “Is slavery a moral and political evil,” and “Ought not America to attempt an emancipation of the Negroes,” Whig members consistently argued against emancipation. In 1839, for example, Whig members agreed with the proposition that it would “be bad policy to immediately abolish slavery” by a vote of 24 to 6. Despite the occasional close vote, as a whole Whig’s pre-Civil War debates revealed strong pro-slavery leanings. At times, anti-abolition rhetoric flared into dramatic outbursts, with one member proposing that “no person be admitted into [the American Whig Society]… who is an abolitionist in any sense of the word.” Although members struck down the proposal, the very fact that it was raised at all indicates that Whig served as a consistent bastion of conservative Southern thought in early 19th century Princeton. In the case of Cliosophic (today Princeton’s right-leaning house), debates represented a similar, though not as extreme, sympathy for Southern slaveholding ideals. Compared with Whig, more of Cliosophic’s members came from Northern states—resulting in more frequent votes favoring the emancipation of slaves. Cliosophic’s records, however, indicate that pro-abolition debate outcomes were still outnumbered by regular anti-abolition outcomes. As the Civil War approached, debates in Cliosophic began to shift away from the wrong or right of slavery to indirectly related topics such as resistance to government, state secession, and Congressional power. In 1846—a year with relatively low Southern membership—Clio students concluded that state governments had “the right to secede from the Union [if] they think a law passed by Congress [is] prejudicial to their interests.” Whig Society historian Jacob Beam has argued that votes on debates about slavery were more “indicative of the spirit of sectionalism of the times and of the large numbers of Southerners in Whig” than the strength of members’ arguments. But clearly, Northern-born Clio members were nearly as prone to uphold pro-slavery, pro-secession principles as Southern-born Whigs. Notably, Whig and Clio records reveal that members may have paid greater attention to the merits of students’ arguments (rather than preconceived biases) in other frequently-debated topics unrelated to slavery. For example, debates over male and female mental capacity were decided with fairly even variation—sometimes in favor of gender equality, sometimes not. This starkly contrasts with the consistency of anti-abolition decisions in both societies. Thus, while members of Whig and Clio set aside their biases for certain debate topics, they were unable to do so when discussing slavery. As a result, both societies helped foster a pro-slavery (or at least anti-abolition) campus climate. 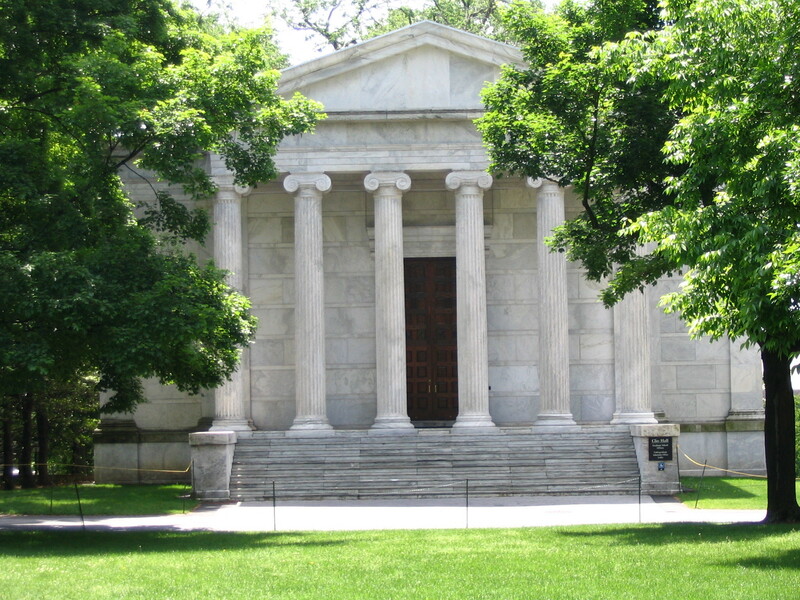 Present-day Clio Hall on the Princeton University campus. Beyond holding debates, Whig and Clio also regularly invited prominent speakers to deliver addresses before their houses. As the Civil War approached, these addresses became more and more geared towards Southern supporters, reflecting the increasing Southern membership in Whig. The orations, sometimes functioning as commencement addresses, imparted final advice to students before they graduated and took up leadership roles in American society. I do not come here to discuss the great political questions, which divide and agitate our country. Some of you may be called to participate in their decision. I recommend to you, to become acquainted with all these great interests, and to acquire an accurate knowledge of the statistics of your own, and of the other commercial nations of the world. Seventeen years later, Alexander E. Brown ('1820) spoke on the importance of education to the preservation of justice in the nation. In his speech, Brown found it necessary to address the problem of slavery. He admitted that “learned men have been found upon the side of the oppressor,” though he seemed to find no inherent conflict between this statement and his general call for the educated to protect justice for all. Abby’s plea pointed to the complicated relationship between Whig and Clio in pre-Civil War America as an intellectual meeting ground for Northerners and Southerners in an increasingly divided nation. Perhaps it was this reverence for unity that led students in the pre-Civil War years to favor a unified nation with slavery over a fully free one, and in the post-war period to ignore the legacy of slavery and emancipation in the college’s Civil War memorial. Ultimately, the Whig and Clio societies’ “little Republics” provided students with the opportunity to clash over divisive issues with words rather than weapons for nearly a century—until, in 1861, civil debates turned into Civil War. Samuel Niu is an undergraduate member of Princeton University's Class of 2019. He is majoring in History with a minor in East Asian Studies. “The American Whig-Cliosophic Society,” accessed March 21, 2017, https://whigclio.princeton.edu/about/history/. Jacob N. Beam, The American Whig Society of Princeton University (Princeton, NJ: American Whig Society, 1933), 205-206. Ronald David Kerridge, “Answering ‘The Trumpet to Discord’: Southerners at the College of New Jersey, 1820-1860, and their Careers” (Senior thesis, Princeton University, 1984), 61-62. Jennifer Epstein, “Slaves and Slavery at Princeton” (Senior thesis, Princeton University, 2008), 99. Final Minutes; Clerk's Documents; 1802-1941; American Whig Society Records, Princeton University Archives, Department of Rare Books and Special Collections, Princeton University Library, and Final Minutes; Clerk's Documents; 1792-1940; Cliosophic Society Records. Order of Commencement; Princeton University Commencement Records, 1748-1860. “Commencement,” Federal Republican and Commercial Gazette, October 11, 1809. Beam, The American Whig Society of Princeton University, 132; Final Minutes of Whig Society, 1802 and Final Minutes of Whig Society, 1851, both in Clerk’s Documents. Beam, The American Whig Society of Princeton University, 132-133. Kerridge, “Answering ‘The Trumpet to Discord’: Southerners at the College of New Jersey, 1820-1860, and their Careers,” 132-133. Final Minutes, 1846-1856; Clerk’s Documents; Cliosophic Society Records. Beam, The American Whig Society of Princeton University, 132. Final Minutes, 1846-1856; Clerk’s Documents; Cliosophic Society Records, and Final Minutes, 1846-1856; Clerk’s Documents; American Whig Society Records. Berrien, John M; 1829; Cliosophic Society Records. Brown, Alexander E.; 1846; Cliosophic Society Records. Abby, George F.; 1853; Cliosophic Society Records.